For 32 years I have been carrying around this type of card in my wallet. Another 1.7-million Catholic men are doing exactly the same thing, at this very moment in several countries. We call each other Brothers. We are not only a service club or some goofy society with a secret handshake. We do not forget what happened when we rode the goat. There is nothing to be concerned about from even the least of our Brothers: unless you’re wanting to harm someone. You may not know me directly, but I imagine everyone reading this post, knows someone like me. Let them know from me that they shouldn’t let anyone buy a franchise. I will explain in detail to them but You’d grab some stranger if they were about to step in front of bus, wouldn’t you? 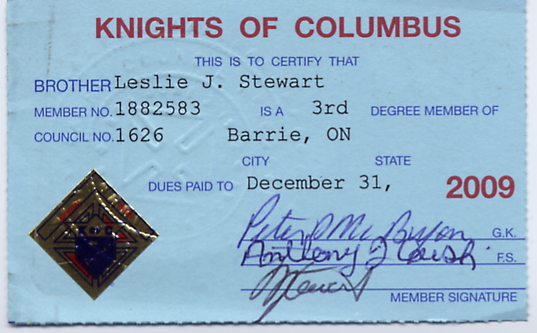 I was a Columbian Squire for four years before becoming a Knight. Columbianism started with a young priest wanting to help Irish widows. This entry was posted on Sunday, February 1st, 2009 at 4:44 pm and is filed under Fraternity, Unsafe at any Brand. You can follow any responses to this entry through the RSS 2.0 feed. You can leave a response, or trackback from your own site.